In September 1868, the remains of Jacob and Nancy Jane Young were found lying near the banks of Indiana’s White River. It was a gruesome scene. Part of Jacob’s face had been blown off, apparently by the shotgun that lay a few feet away. Spiders and black beetles crawled over his wound. Smoke rose from his wife’s smoldering body, which was so badly burned that her intestines were exposed, the flesh on her thighs gone, and the bones partially reduced to powder. Suspicion for both deaths turned to Nancy Clem, a housewife who was also one of Mr. Young’s former business partners. 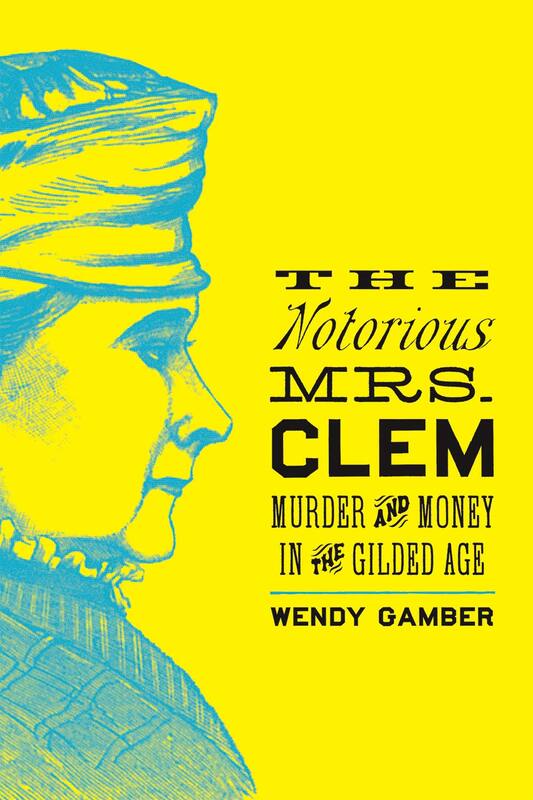 In The Notorious Mrs. Clem, Wendy Gamber chronicles the life and times of this charming and persuasive Gilded Age confidence woman, who became famous not only as an accused murderess but also as an itinerant peddler of patent medicine and the supposed originator of the Ponzi scheme. Clem’s story is a shocking tale of friendship and betrayal, crime and punishment, courtroom drama and partisan politicking, get-rich-quick schemes and shady business deals. It also raises fascinating questions about women’s place in an evolving urban economy. As they argued over Clem’s guilt or innocence, lawyers, jurors, and ordinary citizens pondered competing ideas about gender, money, and marriage. Was Clem on trial because she allegedly murdered her business partner? Or was she on trial because she engaged in business? Along the way, Gamber introduces a host of equally compelling characters, from prosecuting attorney and future U.S. president Benjamin Harrison to folksy defense lawyer John Hanna, daring detective Peter Wilkins, pioneering "lady news writer" Laura Ream, and female-remedy manufacturer Michael Slavin. Based on extensive sources, including newspapers, trial documents, and local histories, this gripping account of a seemingly typical woman who achieved extraordinary notoriety will appeal to true crime lovers and historians alike. Wendy Gamber, The Notorious Mrs. Clem: Murder and Money in the Gilded Age (Baltimore: Johns Hopkins University Press, 2016).